The Columbia River Crossing (CRC) mega-project was a freeway expansion, tolling, and light rail project along a five-mile stretch of Interstate 5 between Portland, Oregon and Vancouver, Washington. The CRC was created in 2005 to complete a buildable plan in 3 years at a cost of $50 million. Approaching nearly a decade, the CRC spent over $180 million - a 260% cost overrun. The $180 million spent on design is only 5% of projected construction costs of the $3.6 billion project. With the evidence below, it's hard to ignore that the CRC plan was wasteful, outdated, and needed to be shut down. Rep. Frederick speaks on the Floor of the Oregon House, February 25th 2013, on House Bill 2800, the Columbia River Crossing Bill. 1) The I-5 replacement bridge would create a choke point for river commerce. The proposed new bridge would become the lowest clearance bridge from the Pacific Ocean to The Dalles (190 miles). The CRC plan does not meet current marine traffic clearance needs, will limit future marine business, and goes against national trends of higher bridges for larger vessels. The Columbia River is one of the few important military and commerce major waterways on the West Coast. Water transportation is the most fuel efficient, least polluting, safest, and least expensive means of moving cargo. • The current I5 bridge has a fully lifted clearance of about 176 feet. • The up river Glenn Jackson I-205 bridge has about 144 feet of clearance. • The down river Lewis and Clark Bridge between Longview, Washington and Rainier, Oregon has 210 feet of vertical clearance. • Bridge clearance from the Pacific Ocean to The Dalles (190 river miles). 2) Don't fall for the fear tactics - Our current bridge is safe. There are 795 "structurally deficient" bridges in Oregon & Washington and the Columbia River Interstate Bridge is not one of them. The I-5 bridge is a historic landmark that is safe, with an impressive 178’ of clearance for river traffic that does not impede river commerce. A seismic retrofit to our current bridge could be done for a small fraction of the cost of replacement. • To see the structurally deficient bridges in your area, visit this page and enter your zip code. • There are 362 bridges listed as structurally deficient in Washington and the Columbia River Interstate Bridge is not one of them. • There are 433 bridges listed as structurally deficient in Oregon and the Columbia River Interstate Bridge is not one of them. 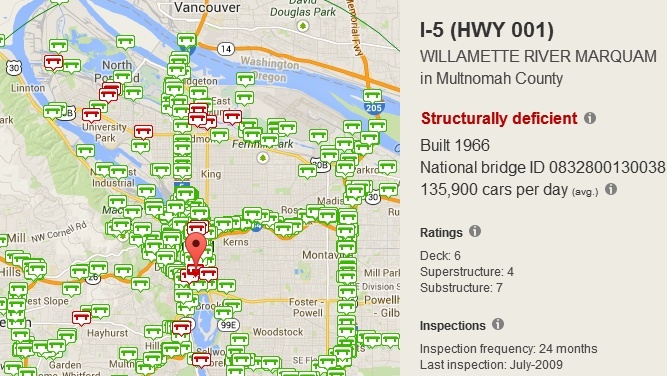 • Overall, Oregon & Washington bridges are in better shape than 90% of the nation. • Washington has over 400 bridges in its Seismic Retrofit Program that need seismic retrofitting. • Our historic bridge is one of many listed in the National Register of Historic Places (NRHP). • A seismic retrofit to our current bridge could be done for a small fraction of the cost of replacement. • A majority of Portland bridges have a major issue with seismic vulnerability. 3) North Portland Harbor Bridge has over 60 years of lifespan remaining. One of the most-used and yet most obscure bridges in town - The North Portland Harbor bridge built in 1987 carries I-5 over the North Portland Harbor (often called the "Oregon Slough" and "Hayden's Slough") between Hayden Island and Delta Park. The CRC plan estimates $25 million to remove and 95 million to replace. This bridge as-is now could last over 60 years with no major rehabilitation. 4) The BNSF Railroad Bridge offers a better solution. By resurrecting the 2004 "Vancouver BNSF Rail Bridge Project" the only "stop-light" on I-5 would be nearly eliminated. 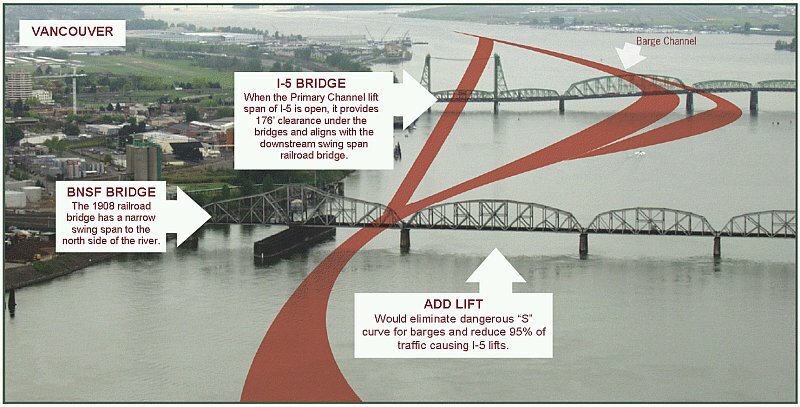 Over 90% of I-5 bridge lifts would be eliminated by updating the downstream railroad bridge. The railroad bridge is a swing bridge, but the swing is aligned with the lift section of the I-5 bridge. If the railroad bridge was updated with a middle lift, barges could pass under the tall south side section of I-5 without lifts. This project is shovel ready and has previously been given the green light by the US Coast Guard. Benefits of the "Vancouver BNSF Rail Bridge Project"
• It's a fast project - The same project was done in 1989 on the same rail line over the Willamette River and the rail line was only down an amazing 72 hours due to off-site pre-fab design of the lift section. In Short: The railroad bridge is a swing bridge, but the swing is aligned with the lift section of the I-5 bridge. If the railroad bridge was updated with a middle lift, barges could pass under tall south side section of I-5 without traffic causing lifts. In Detail: When the Primary Channel lift span of I-5 is open, it provides the tallest clearance (176') under the bridges and aligns with the swing span of the downstream over a century old 1908 railroad bridge. When the lift span is closed the tallest clearance is at the Barge Channels (72'). When using the Barge Channels, vessels must navigate an "S" curve between the I-5 Bridge and swing span of the Railroad Bridge. Captains most often use the Primary Channel because the "S" curve maneuver used to avoid lifts is considered one of the most dangerous maneuvers on the Columbia River. Thus, the Railroad Bridge causes most traffic causing I-5 bridge lifts. More on the "Vancouver BNSF Rail Bridge Project"
• Frequently Asked Questions about the Vancouver BNSF Rail Bridge Project by the CFO of Bernert Barge Line, Inc.
• Currently, the BNSF Rail Bridge presents an unreasonable obstruction to navigation with a horizontal clearance of 200 feet vs. 600 feet found in each direction from the rail bridge. 5) The current plan is a waste of taxpayers funds. The CRC has spent an average over $70,000 of taxpayers cash per day in its design stage. This would balloon to over a million per day during construction. The enormous cost of this project and its side effects will continue to be a burden on local commuters, taxpayers, and state budgets for decades if it is not stopped. The plan does not solve congestion, impacts Clark County with 45 years of debt, has been spotted by fiscal hawks as another step closer to the "fiscal cliff", and with interest and cost overruns could cost over $5 billion up to $10 billion. The CRC still has no buildable plan, no secured construction funding, and ever mounting mitigation issues due to unacceptable bridge height to accommodate light rail. • The D.C. based group Taxpayers for Common Sense is generally well-respected as a fiscal hawk willing to take on projects adored by the right and left. Page 27 of their report says the CRC should be axed from the federal budget to help avoid sequestration - or the so-called "fiscal cliff". • The CRC plan will not solve traffic issues - The massive project will reduce only 60 seconds off the peak morning commute and create more issues with the Portland Rose Quarter. • Independent study by Joseph Cortright, a widely-published leading economic analyst and an expert in regional economic analysis and development, shows how the project with interest and cost-overruns could cost $10 billion. The report raised questions about cost estimation, traffic modeling and financial planning methodologies used for the CRC. • As of Jan 2013, the CRC has spent over $170 million. • As of Jan 2014, the CRC has spent over $190 million. • The Runaway Bridge Budget: State transportation officials stood by as planning costs ballooned. 6) Pork. There are over $100 million of questionable expenditures tucked into the current bloated plan. • As indicated by Congresswoman Jaime Herrera Beutler, this project is full of questionable expenditures and finances. • Plans for the $3.5 billion megaproject include upgrades to Portland's Steel Bridge, plus a significant expansion of a TriMet maintenance facility in Gresham. Both would be paid for by the $850 million federal grant that the CRC is banking on to build the light rail extension from Portland to Vancouver. 7) Mitigation. 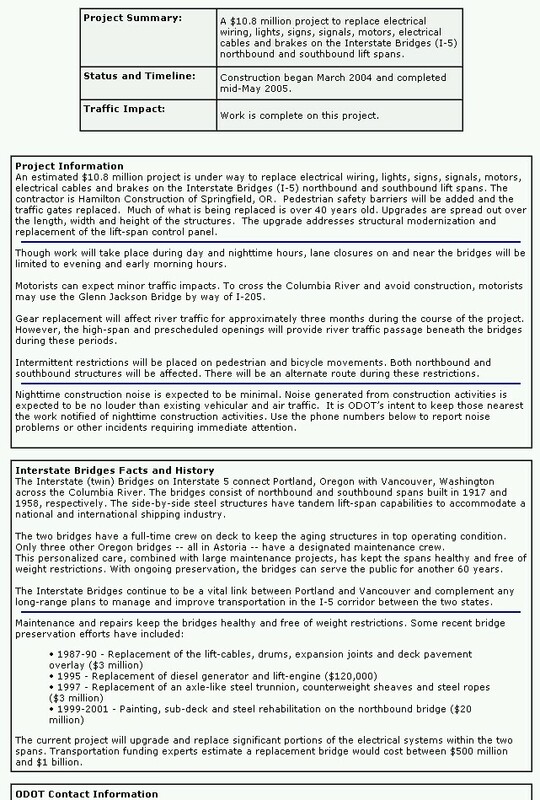 Oregon taxpayers would pay three manufacturers $86.4 million to compensate for the bridge being built too low. Many more legal challenges will come from WA that will increase OR cost. 8) Tolls will take away money from our local economy. A bi-state commuter could easily spend $2,000 per year on tolls. CRC’s own documents show tolls could be high as $8 each way and 4 times as much for large trucks. Tolls would increase costs for local businesses relying on freight deliveries for daily operations. Tolls will also stick Clark County commuters with an extra $400 million for improvements to Oregon interchanges. Local citizens will be paying tolls on the debt until the year 2060, and tolling I-205 is being considered. • The drain on the Clark County economy would be approximately $10 million per month. If the 60,000 vehicles that cross I-5 were to pay an average of $4 toll each way ($8 round-trip), for 250 work days a year, it would cost each commuter nearly $2,000 per year. • The CRC estimates $169,300,000 in tolling revenue for the first year. That is approximately $14 million per month in tolls that will hopefully cover the bond payments for the bridge. • The range of tolls analyzed for consideration are up to $8 each way. • Citizens have been being told tolls could reach $8 since back in 2009 when then mayoral candidate, now Mayor of Vancouver Tim Leavitt revealed it. • Reps Moeller and Wylie submitted their "Plan B" if the $450 million for the CRC doesn't make it into the transportation funding package. The 1/3 Washington share of the CRC cost will be paid with tolling revenue, excise taxes on motor vehicles, and special fuels (diesel & biodiesel). • Tolling has exorbitant cost and privacy issues. • Toll revenue projections are wildly optimistic. • About a third of toll revenue is ate up by cost. CRC project office continues to mislead both the public and legislators by claiming the total costs of the project to be $3.5 billion. These costs represent solely the costs to construct the project. 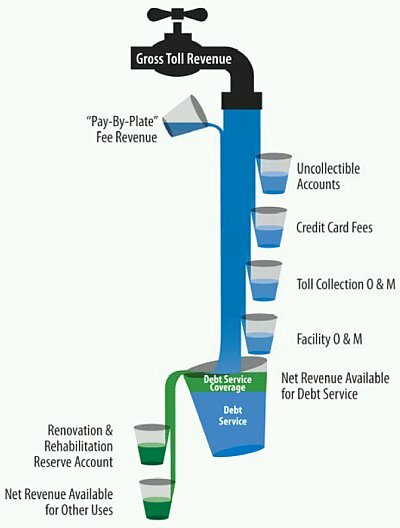 The CRC current funding plans call for an additional $2.0 billion in debt service costs, toll collection costs, and ongoing operation and maintenance costs; bringing the total cost of the CRC project to approximately $5.5 billion. “This bill, by itself, gives ODOT essentially unlimited authority to borrow as much as it wants for CRC, and pay bonds back from any combination of toll revenues, future gas tax receipts and federal grants." 9) The CRC plan is a job killer. The FEIS does not factor in the thousands of long term jobs lost due to the relocation of businesses because of the proposed low bridge plan. The CRC plan does not address the root issue of bi-state commuter traffic - a lack of jobs in SW Washington. The plan will destroy more local long term jobs than it creates and further promotes our dependance on jobs in Oregon. • The CRC plan does not create as many jobs as claimed. The “average annual regional jobs” created is not 20,000, but actually 1,907 temporary jobs. • Four manufacturers operate on the Washington side of the river at the Columbia Business Center, with 4,000 employees earning $300 million in salaries. Many are at risk due to the proposed low bridge plan. • Vancouver Business in Historical Kaiser Shipyard Threatened. This short video spells out how the CRC plan threatens many good long term jobs in Vancouver. 10) Major negative impacts on Downtown Vancouver. The current plan will kill our revitalized downtown Vancouver just as it’s blooming. Tolls, light rail, and 6+ years of construction without financial mitigation for indirect impacts will kill the small business community in downtown Vancouver. • It has taken 20 years to revitalize our historical downtown core. • Resolution M3663 “Attachment A” that protects downtown businesses has been abandoned. • The current plan does not avoid historic properties. • There is no mitigation assistance program in place to help businesses impacted by construction. Seattle did it - Why can't we? • Check out the problems St. Paul, Minnesota are having with their first year of light rail construction. 11) An Environmental Injustice. Rep. Frederick spoke on the Floor of the Oregon House, February 25th 2013, on House Bill 2800, the Columbia River Crossing Bill. Frederick stated the neighborhoods in his district around I-5 in North Portland have the highest asthma rates in the State of Oregon. Advocates for air quality and children’s health have raised alarms that congestion caused first by the construction project itself, and then by shifting the I-5 bridge bottleneck south into a traffic jam in North Portland, will cause an increase in air pollution in a region that is already struggling with health concerns. • Part 1: CRC to disappoint those believing its empty promises. • Part 2: ROAD RAGE: Could Fury Over Freeways Topple Plans For A New CRC? Or Will Portland Join the “FREEWAY ARMS RACE”? • Part 9: The Media's Role, Did The Oregonian Use Misinformation To Sell An Expensive Unneeded Bridge To An Unwary Public? 14) Not supported by Clark County voters. Light rail has been firmly voted down multiple times by SW Washington voters since 1995. 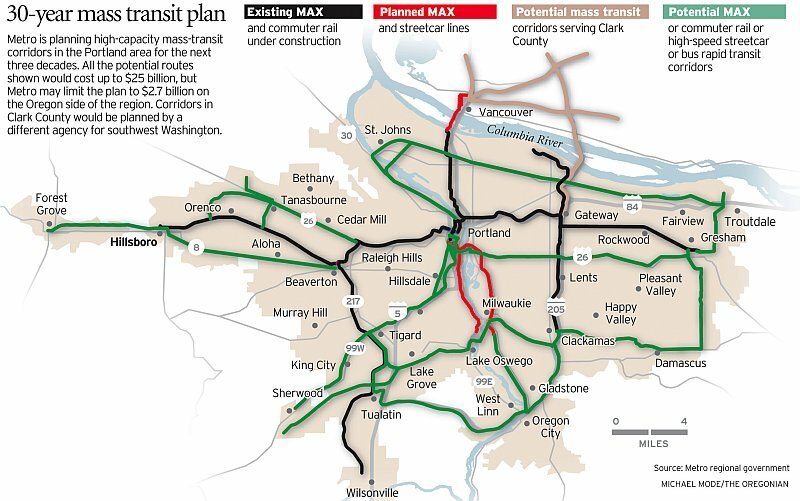 • 2012 Proposition 1 failed a public vote in Vancouver Washington on a sales tax increase for the C-Tran share of maintenance and operations cost of the Tri-Met MAX light rail extension between Expo Center and Clark Park & Ride. • Southwest Washington Officials Respond to Rejection of Proposition 1 - Current and newly-elected officials from the federal, state, county and city level push for a new path for CRC. • The Revised Code of Washington (RCW) Chapter 81.104 on high-capacity transportation (HCT) systems requires voter approval. 15) The CRC plan has been designed around controversial light rail from day one. Oregon’s Supreme Court decision stated that the massive project is only a “political necessity” to persuade Clark County residents to accept a light rail line to Vancouver. 16) Portland’s TriMet is broke. Why put our healthy C-Tran on the hook for TriMet's financially failing light rail in Vancouver. C-Tran would be responsible for millions of dollars annually to maintain a light rail extension into Vancouver. The enormous cost of light rail includes increased insurance rates for businesses and residents near light rail lines, new taxes for law enforcement, enormous taxpayer subsidies, and loss of street parking for businesses. 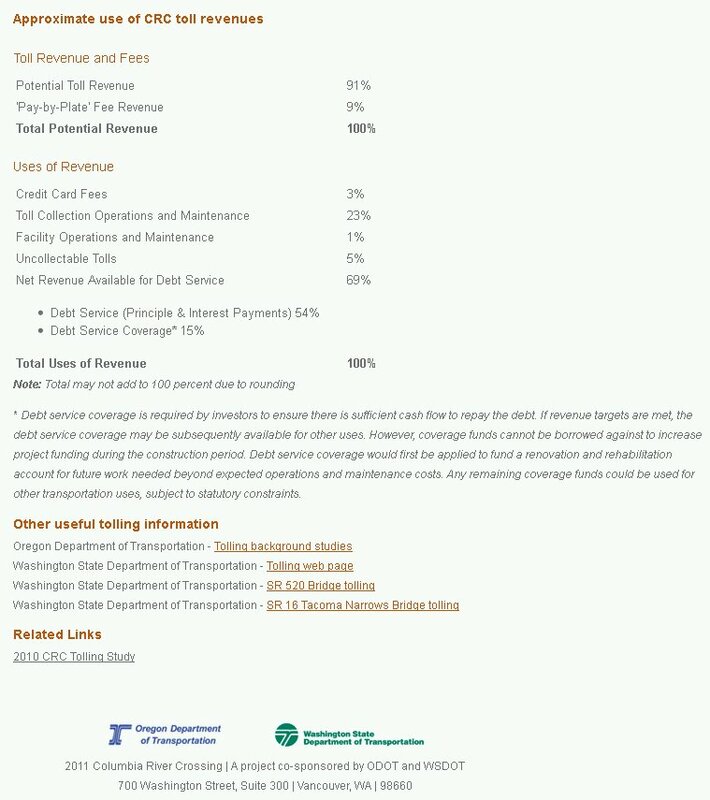 • TriMet’s unfunded liability was $832 million as of 2009 and has now grown to 1.3 billion of debt. • TriMet is in jeopardy of not meeting its present or future plans because of significant structural problems related to its finances. • Why should Vancouver pay $2.57 million annually to maintain a light rail extension into Vancouver for Portland's TriMet light rail trains? • Due to TriMet's financial trouble, security cutbacks have resulted in rising light rail crime rates. • To reduce crime, police and security increases will incur more costs to tax payers. • Did TriMet's light rail resolve traffic issues for Hillsboro, Beaverton, Tualatin, Gresham and Clackamas? • Light rail may not be fully paid for by federal funding and most likely C-Tran and local taxpayers will be responsible for the hundreds of millions of dollars short-fall. • TriMet wants more of Vancouver than just rail to Clark College - They plan to take it all the way back across 205. Who will pay Operation & Maintenance? • Buses are faster, more flexible and one incident does not shut the system down. 17) Parking Impacts. Light rail in downtown would eliminate valuable street parking in trade for a blight of costly parking structures. • The light rail couplet eliminates 125 on-street parking spaces and the cost to replace on-street parking with structured parking ranges from $35,000 to $50,000 per space. • The CRC has three park-and-ride garages slated to be built in downtown Vancouver for light-rail commuters which are expected to cost $158 million to $176 million. • Vancouver's parking garages and lots lost about $1.97 million in 2011. 18) Light rail is slow. A summary of key metrics clearly shows that light rail compares poorly to buses. • The Locally Preferred Alternative in the FEIS, light rail, appears to be spending a minimum of $855 million to implement a transit option that will increase the current downtown Vancouver to downtown Portland travel time from 16 to 36 minutes. 19) Inability to Perform. Millions spent on scrapped bridge designs and years spent on multiple attempts to complete a plan the Coast Guard would permit. • The first bridge design was engineered so poorly that it had to be totally scrapped. For years, CRC had envisioned an ambitious double-decker structure with V-shaped girder sides but a special committee of world famous engineer recommended terminating the bad design. • River users said Columbia River Crossing too low, and planner ignored them. • 2012 - Coast Guard cannot accept a permit application while “mitigation discussions with potentially impacted river users” continue. • 2013 - Application not accepted due to a lack of underlying data or analysis. 20) Conflicts of Interests. From a governor adviser also working for the project’s biggest contractor, hiring new contractors previously employed by the CRC, to a Senior Civil Engineer mayor working for a firm that also receives funds from the CRC, there are several ethical issues with the project. • Patricia McCaig, Oregon Gov. John Kitzhaber's top adivser on the Columbia River Crossing also works for the project's biggest contractor and is facing an ethics complaint for her work to push the project through the Oregon Legislature. • Vancouver Mayor Leavitt has several conflicts of interests. • Newly-appointed Transportation Secretary Lynn Peterson announced Thursday that Ron Paananen, now a private consultant, will lead a comprehensive assessment of the CRC project. Ron Paananen's private employer, engineering firm CH2M Hill Inc., receives millions in consulting fees from DOT, including current payouts of $2.4 million on the CRC. 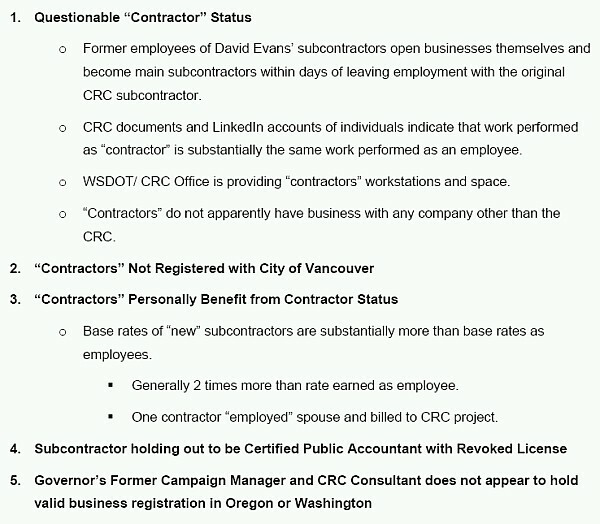 • Background searches on CRC subcontractors paid more than $250,000 over the course of the project (which began in May 2005) found that several companies were formed between May 2005 and December 2011, indicating that they were not in existence prior to the CRC project's existence. 21) Lack of Transparency. Violating public meeting laws, discouraging public input, limiting scope of study for a predetermined outcome, sheltering huge cost of interchanges into the bridge to justify tolling, and blocking the release of financial statements. • David Evans (who has now received over 100 million from the CRC) sued Washington State Department of Transportation to block the release of audited financial statements. • Alternatives with merit were not considered that need to be thoroughly studied and the scope of study was intentionally limited to obtain a predetermined outcome. • Forensic Accountant and Fraud Examiner Tiffany Couch, reveals the gross differences between the costs published by the CRC and their real budget. • Early stages violated public meeting laws and deliberately discouraged public involvement. • Acuity Group analyzed documents and compiled data over the course of more than 18 months in an attempt to provide clarity related to the expenditures of the Columbia River Crossing project. • The budget indicates costs for Washington and Oregon interchanges are hundreds of millions of dollars more than the amounts being reported to decision makers. The budget also indicates the cost to rebuild the interstate bridge is hundreds of millions of dollars less than the amounts being reported. As a result, it appears that the shifting of interchange costs to the interstate bridge increases the burden of costs to toll payers. 22) CRC lacks vision. Since 2005 we have been experiencing enormous growth in telecommuting, Americans drive fewer total miles today than we did eight years ago, and traffic projections by the CRC to justify the project are failing. The CRC lacks vision and uses a mid-20th century freeway-only mentality. • Telecommuting grew by 73% between 2005 and 2011 compared to only 4.3% growth of the overall workforce. • The unmistakable message of the 2009 American Community Survey from the US Census Bureau shows a 31% increase from 2000 to 2008 in employees that now work at home. Working at home has been the fastest growing component of commuting for nearly three decades and has been accomplished with virtually no public investment. • The Driving Boom is over. Americans drive fewer total miles today than we did eight years ago. • The CRC plan ignores the effects of induced demand. • This presentation explores the effects of Induced Demand on the Columbia River Crossing highway expansion project. • More on induced demand. In 2002, rather than building more roads to meet the traffic demands, the city of Seoul made a decision to do the opposite and demolished a major downtown freeway. • Traffic Studies Systematically Overstate Benefits of Road Projects. • The CRC lacks vision and uses a mid-20th century freeway-only mentality. On March 25th 2010, a panel of VIP experts gathered in Portland for a frank, engaging, provocative discussion of the proposed CRC project on I-5. • The CRC should suffer the same fate as the Mount Hood Freeway project. 23) Local Traffic. 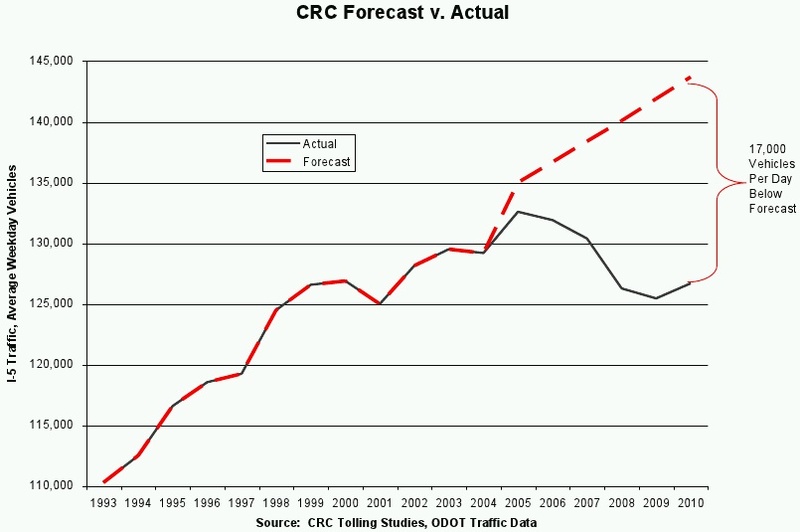 Actual data show CRC traffic forecasts to justify the project are failing. • CRC traffic forecasts are wrong, truck traffic is down, ODOT's gas tax forecast wildly off, and vehicle travel is down. • Traffic rose just 1 percent from 2002 to 2011, according to the most recent counts available, even as the county's population grew 17 percent. • Current traffic levels are 17,000 vehicles per day below the levels forecast by CRC. 24) I-205 Impacts. Diversion from the CRC project area will force improvements, expansion, and tolls on I-205. 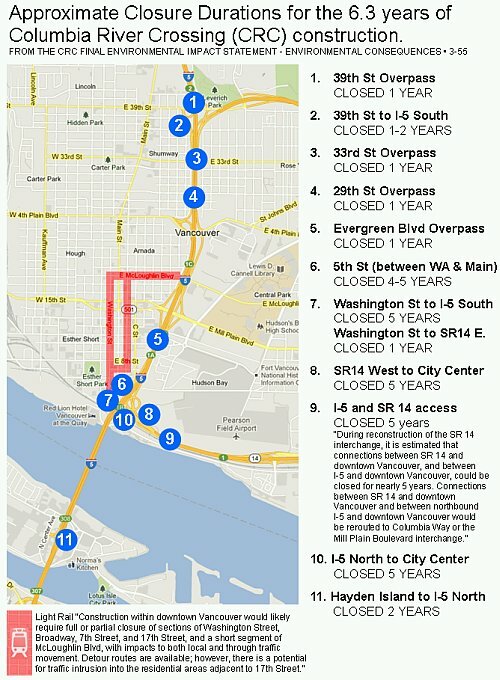 • Up to half of all current users of the I-5 bridges will divert to other routes when the bridges are tolled. • Washington is setting up its southern neighbors to hold the funding bag when money for the Columbia River Crossing falls short, incoming Metro Councilor Bob Stacey says. 25) High-Speed Rail. Billions of tax dollars are already being spent on heavy rail improvements to increase speed and capacity for freight and commuters. • Pacific Northwest corridor has received about $1.5 billion dollars in federal funding for rail improvements. • Amtrak and California Rail Authority will join forces for high-speed rail. • A plan like the Cascadia Multi-Modal Bridge will accommodate BNSF/UNP rail freight, commuter and high speed rail and motor vehicles for a fraction of the cost with far less impacts. • There are 7 trainsets in the Amtrak Cascades fleet of equipment - WSDOT owns three, ODOT two, Amtrak two. 26) Autonomous Taxis, Ride-Hailing, Ride-Sharing. These rapidly developing technologies will undoubtedly be huge disruptors in transportation and real estate. • The Transportation Revolution. This study by Green Street Advisors predicts a 50% decline in needed parking spaces and suggest vehicle ownership may have peaked last decade due in part to urbanization and changing preferences amongst millennials. • General Motors (GM) executives said the company plans to deploy a large-scale fleet of driverless taxis in large cities by 2019. • The automotive industry thinks personal car ownership will plummet in the coming decades. Many big name companies are pouring money into the self-driving taxi business. With this evidence, it's hard to ignore that the CRC plan was outdated, wasteful, and needed to be stopped. During these times of budget shortfalls, debt, growing environmental concerns and a rapidly increasing trend of people working from home (telecommuting), it is painfully clear that freeway expansion, tolls, and light rail is antiquated thinking. Treat the cause, not the symptom. The problem is not the bridge, it is why we cross the bridge. Our efforts would be better spent on promoting local businesses that provide long term job opportunities to attract cross-state commuters to stay closer to home and encourage our residents to spend locally which would strengthen our city and spur more local jobs. 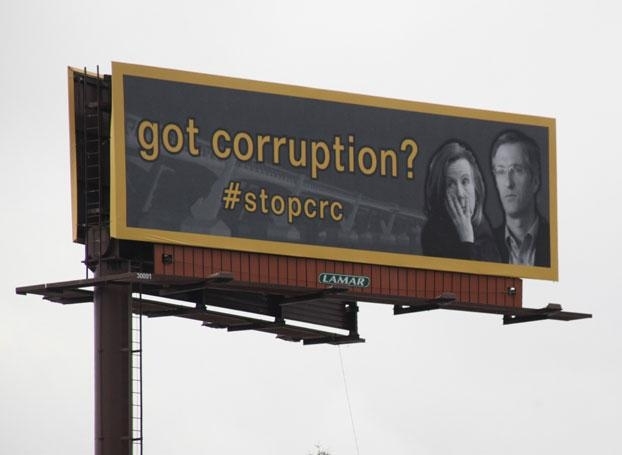 StopCRC.com is a growing coalition of bipartisan and bi-state, citizens, businesses, property owners, and activists. This site is intended to inform the public. If you find any errors in this web page or have evidence of misinformation - please contact info@stopcrc.com and we will research and correct any errors found.